As a big Man myself I know all too well the importance of a strong sturdy chair. 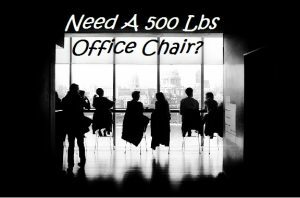 But what is the best Big And Tall Office Chairs With A 500 Lbs Weight Capacity limit?. Not too many chairs can handle such a heavy weight capacity and only few are any good we believe. With a couple obese workers in the office, it was of high importance to investigate what office chairs they recommend if any at all. The results were as I thought… Not too many options and not many places to buy these 500 pound capacity office chairs from the research I performed. After many many broken chairs the big guys finally came across a few heavy duty and durable chairs which stood the test of time. One chair in particular was referred to as simply the best for us extra large people. After further research, I agreed that these guys were spot on with there recommendation. It really is a beast of a chair as you will now discover below. As some may unfortunately know, office chairs simply wear out fast if your a big man. Especially the pneumatic lift as most heavy duty labelled chairs can hold a maximum of 350 lbs before the lift fails. But I don’t reckon so with this monster of a chair. The OFM Avenger LX 810 is without a doubt the strongest pneumatic lift chair we have come across. To be able to function well with up to 500 lbs of weight is incredible. I’d even go as far as to say the OFM big and tall chair is really the only choice for big men needing an executive chair. This isn’t a bad thing because it is the chair recommended by fellow obese work colleagues. As you might expect from the heavy weight limit capacity, the recline option is not available. However I find reclining at my size to be a daunting time anyway. As for comfort I would rate this extra large chair an impressive 8 out of 10. Not bad for a chair of this size. The 1 inch padded arms go well with the super thick 24 inch wide seat. I don’t think you will ever bottom out on this chair. Plenty of lumbar support, however it’s not adjustable. Do I feel safe in this chair? Without a doubt. It not only has the heavy duty label, but it also looks strong and feels strong. The base is one solid piece of steel, no visible welded joints. Super strong support starts at the base I always say. The casters are bigger and look much stronger and better made then your normal wheels. I think the only way you can go wrong with this chair, is if you don’t like the available colors. To have arms or to not?. For me I prefer armless office chairs. I find this to be important for us bigger guys as many office chairs with arms tend to dig into our sides. The pinching of the skin makes arms not worth it. 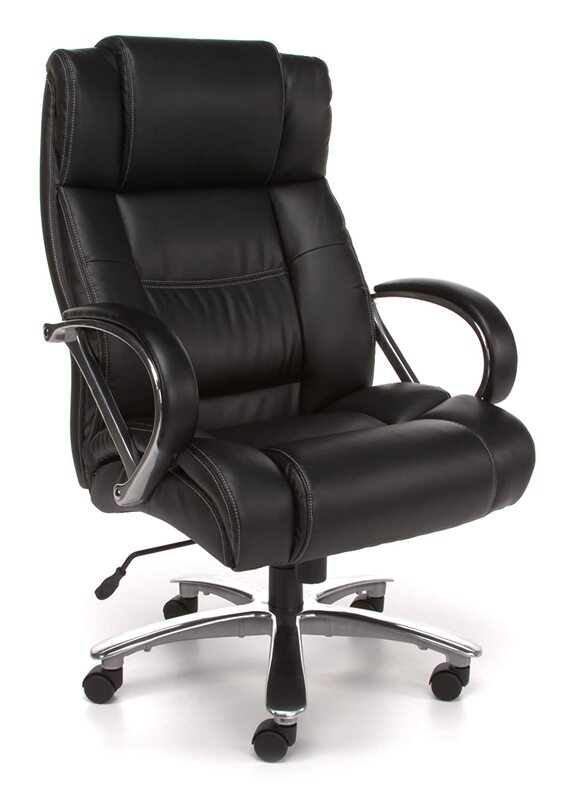 But everyone’s body is shaped differently so here is my best recommended arm less office chair for obese people. 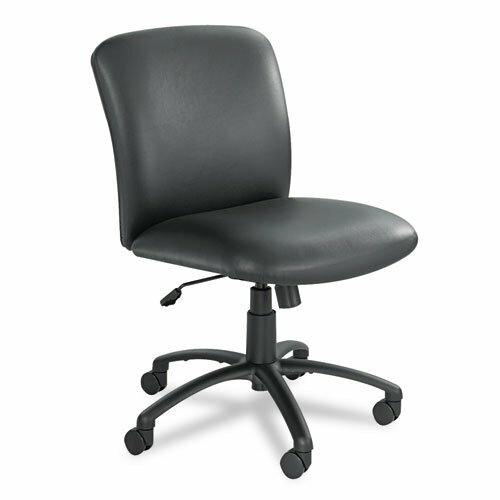 The Safco 500 pound chair is just like any ordinary task chair. But much wider, looks stronger and bigger in general. While basic in design, but what I feel makes this chair so good is it’s ultra heavy duty frame and casters. I don’t need a million bells and whistles ( I find it hard reaching to those handles anyway), but what I do need is a wide comfortable seat with a good high weight capacity rating. This Safco chair delivers just that for me. The seat is a huge 24 inches wide and well cushioned. However I think the padding could be a little more denser. But overall it has a really good feel about it. The backing to the chair has a 1/4 inch thick bracket which supports the back rest. That there is some good reassurance that this chair shouldn’t just snap on you. 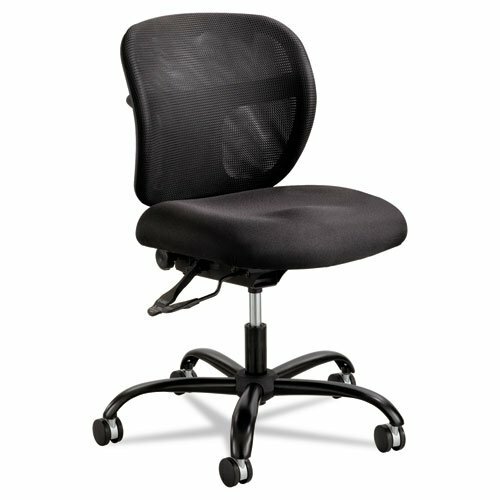 One heck of a strong and wide office chair available in fabric or vinyl. Fabric being my preferred. I can’t get enough of mesh chairs, they are literally the coolest office chairs in the office. Safco have this awesome 500 pound weight capacity mesh office chair and it’s one of the best chairs I’ve ever known. This goes for any weight range. The unique mesh design is meant to mend to your body shape which thus provides such a comfortable sitting station. The mesh also acts as airflow to your back. The very breathable mesh allows cool air to ventilate between you and the chair so you don’t overheat so much. Nothing worse on a hot summers day then to have you skin stick to the chair. Not too mention the immense sweat that you simply can’t hide. I’m all for trying to reduce heat and sweat around the home and office. I find the Safco Mesh chair does an excellent job at it.